If you are new to Oracle or lost in 1000s of pages of Oracle documentation, then these terms patch set , PSU or CPU is sure to create some kind of confusion. Based on my experiences with 11gR2, looks like PSU is the way to go. For example we applied PSU3 to resolve mutex issues since there was no one-off fix w/o the PSU route. I also thought that PSUs were more flexible than I initially assumed because when we encountered another bug(10190759), the bug fix was available only for 11.2.0.2 (w/o PSU 3). Oracle still recommended applying this patch to 11.2.0.2.3(with PSU3) and it worked. 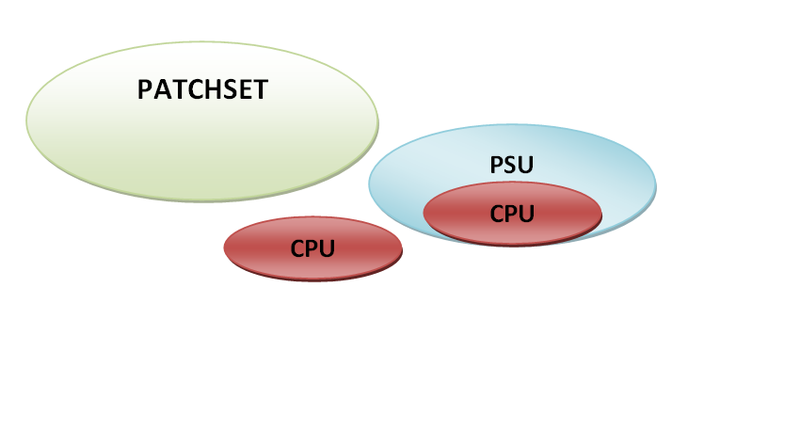 Here is brief summary of what is the difference between patch set , PSU and CPU. I will start with a image, might not be 100% accurate but will help a long way in understanding the differences. PSU’s(Patch set updates) are patch sets but with some major differences with respect to regular patch sets. PSUs are generally low risk and do not contain fixes to bugs that require configuration changes or impact database components like optimizer. To achieve this low risk behavior, Each PSU is limited from 25 to 100 new bug fixes. PSU’s are also well tested by Oracle compared to one off patches. From the database , you can execute the following query(Assuming that catbundle.sql was executed when PSU was installed). The last 2 columns will provide information about the PSU. A PSU can always be applied over any CPU where as applying a CPU over a PSU will roll back the PSU (at least for now). Therefore it is easy to go from CPUs to PSUs and hard to go back to CPUs from PSUs.